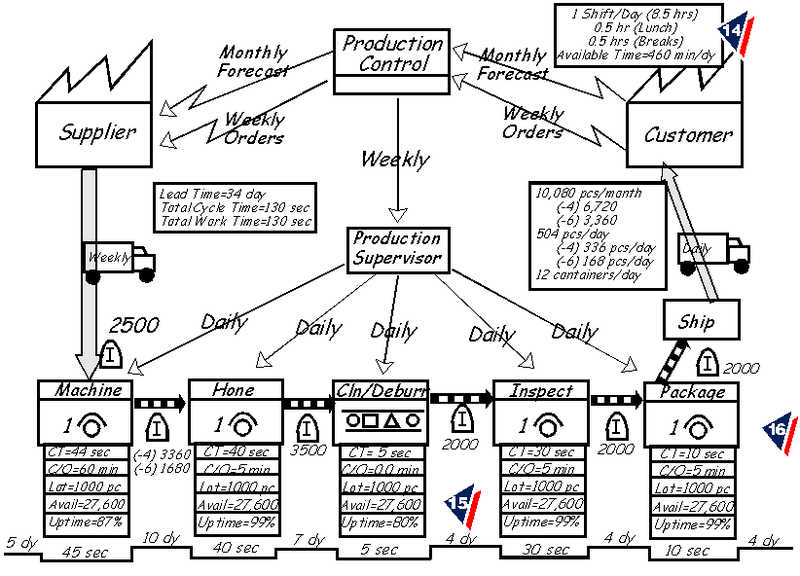 On many value stream maps the “command central” for such information is placed right in the middle of the top of the value stream map and is called “Product ion Control”. (Here’s an example.) 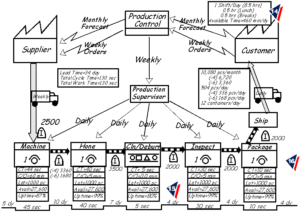 Notice that there are three fundamental types of information that are on the map: info about Customers (forecasts and orders), info for Suppliers (forecasts and orders), and info for the shop floor (production schedules). The objective here is to capture all these info flows on the chart. (On the chart here, jagged lines means the info moves electronically, while straight lines means the info moves in traditional ways, i.e., memo, word of mouth, or email.) You’ll also notice that each info flow mentions the frequency with which the info is transmitted. Your own map might be more “complicated” than this one is. One client’s map had several different ways that orders came in from customers and that was in addition to sales forecasts. You might also show boxes for functions like sales and purchasing in addition to production planning. Or your production plan might go through more hands than those of only the Production Supervisor. All of that is OK; show as many flows of info as they’re are. I’ve found that this step can take a surprisingly long time. Many companies don’t seem to have a good handle as to exactly how they coordinate orders, forecasts, and production schedules. (Yeah, I know…weird, right?) But take all the time you need; it’s important to get it right and lots of insights often come from the discussions that ensue.